Your comments and favs mean allot to me ^3^ Thanks! Commissions are closed but you can note me if you want a price quote! Would you be willing to make me one of these? I'd be more than willing to pay for it. He looks lovely, and I'd just love to add him to my collection. of course you can send me the info by a note. Can you make me one? Whatâ€™s your price? I would looooove to add this to my collection! Are these still up for sale? How does that work? I've never set one up before. Does that mean I get the plushie when it's done? Please make a ebay account and sell a bunch of these, I love to have Spyro and Cynder. I only give my price in private. and since I believe my skills and time is valuable I charge 10.00 EUR per every hour I spend in a project. Head tilt, color scheme, actual size to the ratio of the game, I totally want this in my home as well!! He's all like "Did you hear that?" LOL Too cute! Personally, I'd like to see someone make a Spyro backpack plush since there are no official Spyro backpack plushes that I know of. I wouldn't be able to buy him though. Oh my goodness! This is incredible! You have amazing talent. I would buy one in a heartbeat! Do you sell these? this was already sold. I'm taking commissions if you are interested. I just send a note. 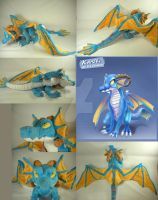 This.... is the most amazing Spyro plush I have ever seen!!! So adorable!! Great work on your Spyro plush! It's absolutely amazing! How much would a spyro cost to be sent to Southampton, UK? you can send me a note.. This is the best plush I have seen of him! Wish I could buy one like this! Wow! This is the best plush I have seen of him! Wish I could buy one!